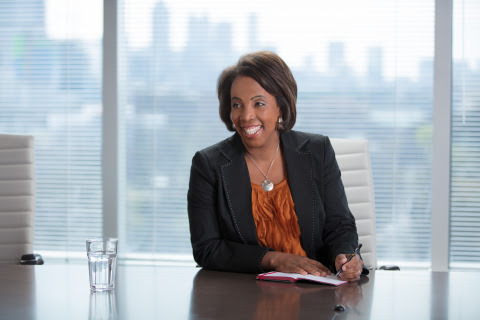 BROOKFIELD, WI (March 4, 2019) — Fiserv, Inc. (NASDAQ: FISV), a leading global provider of financial services technology solutions, congratulates Kim Crawford Goodman, President, Card Services, Fiserv, who has been named one of the Most Powerful Women in Corporate America by Black Enterprise magazine. Goodman was recognized as one the highest-ranking and most influential African American female executives in the nation. Each executive selected has a direct impact on ensuring their companies are market leaders and plays a leadership role in revenue generation, profitability and strategic development. Honorees hold top-tier and executive officer positions of the entire enterprise, oversee major global, national and regional subsidiaries and divisions, and maintain significant budget authority. Goodman joined Fiserv in 2018, and leads the company’s Card Services business, which enables debit and credit processing, ATM payment solutions, the Accel® debit payments network, the MoneyPass® surcharge free network, and fraud protection solutions for thousands of financial institution clients. Goodman is committed to delivering financial services technology with a client-first focus, and her leadership style centers on recruiting and developing the best people, regardless of background, to help clients win. She has more than 25 years of experience in payments, software and business innovation, and previously served as Chief Executive Officer of Worldpay U.S. In a world moving faster than ever before, Fiserv helps clients deliver solutions in step with the way people live and work today — financial services at the speed of life. The company’s annual Leading Women Summit, which takes place during its Forum conference, elevates the conversation on creating more inclusive leadership environments that spur diversity of thought and perspective. Learn more at fiserv.com.